Looking to add live polls to your video content? Live audience polling is a powerful tool that can be used to dynamically adapt live content based on feedback. This can alter performances, steering content in a direction viewers it to go, while also gathering valuable information from the audience as well. This article discusses the benefits of live polling, use cases, tips and also how to create live polls using the IBM’s video streaming and enterprise video streaming offering. If you haven’t used these services before and want to learn more about it first, check out this Getting Started demo. Live polling offers in the moment feedback that can reflect how viewers are feeling while the session is still going on. Since it’s hitting viewers while they are still engaged, this can be easier to get a response as opposed to asking them to fill out polls after the fact. These polls can tell you immediately what’s working and what isn’t. They can also be used to help engage an audience as well. By giving them an opportunity to participate in the event, attendees will feel that their thoughts and opinions are being heard. Furthermore, it will empower them if their feedback is overtly used to adapt the presentation as well. Audiences can also be curious how others reacted as well, and hearing presenters relate how the overall audience responded to a question can help build their interest. While polling can give valuable, real-time benefits, it can also supply important data after a broadcast is over. Answers to questions can be seen long after an event is over, in fact. Furthermore, if the sample size wasn’t large enough, the question can be asked again during another presentation to get more responses. Alternatively, the data can be kept separate as well, if a pooled response is undesired. Real-time polling can go hand-in-hand with a live broadcast, adding interactivity and also gathering valuable information. Something as simple as involving viewers through letting them choose from potential topics can go a long way toward engaging audiences. 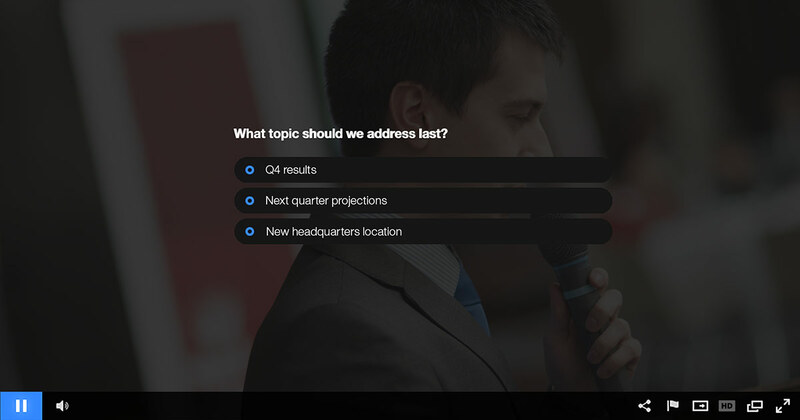 Same as with Live Q&A, allowing viewers to participate in anyway will keep them more tuned into the presentation, which can be valuable for an executive town hall. Doing a live broadcast that could talk to multiple professions? A live poll can be a great way to understand who your audience is and then shape the direction the presentation goes in. For example, if you are doing a video for marketing and discover that most of the audience is in public relations, the use cases and tips can be better directed toward this audience to increase the value they get from it. Gauging how well viewers are taking in a lecture can be valuable for a variety of reasons. Beyond engaging them, making them take in the information more easily, live polls can be used to give the audience a chance to reflect on if they want or need more information on a topic or if the instructor should move to another subject. Since the poll is anonymous, this should avoid users feeling embarrassed if they aren’t grasping a subject as fast as they might like to. This use case is applicable for both education content, such as university curriculum, along with enterprise training courses. Having an entertainment performance shift based on real-time interactivity is a great way to increase engagement. An obvious example would be allowing audiences to dictate a concert’s song selection. While doing this multiple times during a performance can be exhausting, it could be incorporated into the final song of the show. This would, ideally, allow for some preparation but still tap into the live sentiment of the broadcast to make it more exciting. Furthermore, the list would be pre-decided, giving the performer a limited set of options that the song could be. 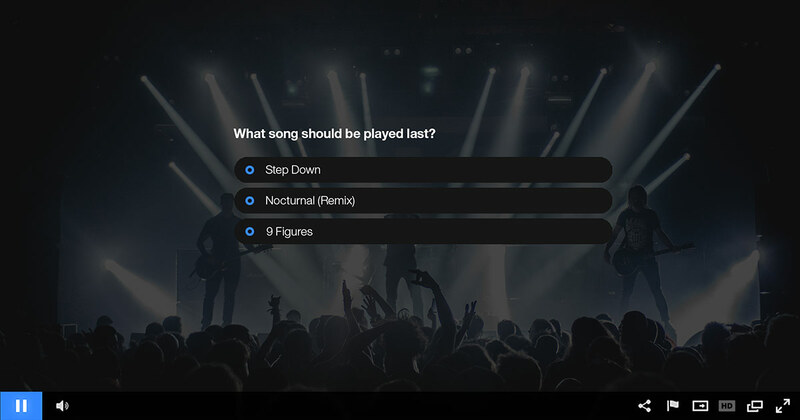 Similar to changing a concert based on feedback, the broadcaster can also use polls to setup pivot points. Want to try something new but aren’t sure how viewers will react? With a live poll you can try a new approach with a backup plan to pivot back if live feedback is showing a negative reaction. Alternatively, if viewers are receptive, the content can be setup to double down on the changes if the audience is liking the new approach. It’s common for an organization to create media events that will include multiple products and multiple announcements. These can energize an audience, but also create some confusion sometimes in terms of which announcement or product is leading the way in buzz. Sometimes what could be considered a “smaller announcement” might actually generate the most positive feedback. Through creating a live poll, an organization can get better clarity on what is resonating best with viewers. A lively speaker can really energize viewers. Quizzing can be a great way to both involve them and also instantly reflect on that as well. For example, the speaker could ask viewers for the answer to a question they know, to see if they are already familiar with the material. In this case, the audience getting that question wrong would probably not just surprise them, grabbing their attention, but also set up a nice oppurtinity for a punchline from the speaker as well. Straight forward, although it should be noted that some people can miss the prompt or not realize what it is. By verbally announcing it during the broadcast, viewers will be on the look out and more receptive as well. Another method to get people participating is to make them want to participate. This can be done through tying the poll to a desired outcome. For example, noting that the video content will change and adapt based on poll feedback. This creates a desire to give that feedback with the idea the viewer can shape the presentation to be more what they are looking for. By announcing the results of a live poll viewers will become more interested in them. This can even convince some to participate, if they didn’t the first time around, now feeling like there is a chance their opinions will be more vocalized. To best capitalize on this, the percentage should be given. This can add a bit of sizzle by letting audience members either know that something was close or it was a landslide, with either outcome adding excitement. The polling feature is part of the “Interactivity” options for a channel. Once there, users can create a poll. Each poll can support 2-5 answers. Users can create numerous polls for each channel as well. Once saved, the polls appear as part of a list. These can be edited if needed, while at a glance they will show how many answers the polls have received as well. Polls can also be archived as well. This will help reduce clutter when a user goes to select a poll to push during a broadcast. Once the polls have been created, they are added to a live stream as part of the Remote Console through IBM’s video streaming and enterprise video streaming offerings. Broadcasters can select a question and push it live during the broadcast. Once live, a small announcement will appear inside the player notifying viewer of the new poll. Clicking this will expand the poll to full screen, letting the viewer make a selection. After completion, a thank you message will appear and then disappear so the viewer can focus on the video content. 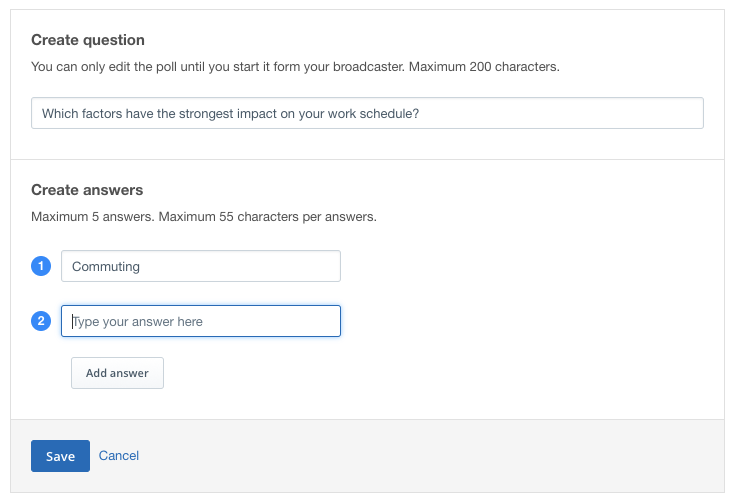 For more details on creating and adding live polls, reference this help article on live polling. The broadcaster, who will see real-time voting results, can elect to end the poll at any time. In addition, new questions can be added, through”Interactivity”, during the broadcast as well. When added they will appear as an option on the Remote Console to choose from. Live polls can be a great way to engage an audience while simultaneously gathering valuable feedback. They can tap into the nature of a live broadcast, making the content dynamic and in the moment, while offering an archived resource of data for future use. Those polls can be reused or recreated to best serve hypotheses or leaning on proven engaging inquiries. When dealing with mammoth audience sizes, polling can work to create a viewer frenzy, especially when voting is involved. This depends on a solution that can reliably deliver live content to large audiences, though. For those more curious on what’s required to reach huge audiences, check out this Scaling Video Delivery white paper for more details.